From the lovely nation of antipodes, Australia (Perth to be exact), comes Ur Draugr. 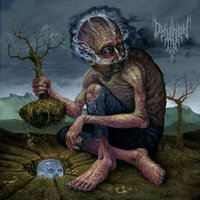 Formed by members of various Aussie underground acts (all of them pretty much unknown to me) this EP combines a variety of extreme metal genres and tries to make it a coherent whole. We get some black metal, some death metal, perhaps some sludge metal and all of it is doused in a huge vat of progressive sauce. I think I explained in an earlier review the problem I have with progressive metal: that most of it is too clever for it's own good. A lot of the bands have an extreme fixation on the technical side of things and in the process the most important thing is overlooked: actually creating good songs.. I can happily tell you Ur Draugr manages to avoid that trap, even though they sometimes stray a bit too far in technical wizardry for my liking. While labelled as an extreme metal band (which it most definetely is) it is remarkable how few of it's 20 minutes running time is actually metal. 'Unseen Golgotha' starts off in a proggy/folky sort of way, before transforming in a full on prog/deathmetal hybrid. The promo text mentions Opeth and it's pretty safe to say that Opeth fans will find much to like in Ur Draugr as well. Fans of the solo works of Dan Swanö and Cynic will do well to check this out as well. The EP is centred on the eponymous track 'The Wretched Ascetic' itself, which is again an amalgam of various black and death and prog parts. Ever shifting in rhythms and riffs, but never in atmosphere, which was for me the main reason it kept my interest. If it was just being proggy for the sake of being proggy, I would very quickly lose my interest. Some tiny drum parts on the EP have me cringing because of their obvious übertechnical/jazzy style, but as a whole Ur Draugr manage to keep this EP free from too much overly tech-y stuff. Which is not to say it isn't clear as daylight that they have an extremely good feel for their instruments and are a very talented bunch of guys, but it never gets in the way composition and atmosphere. A very promising start for the lads from Down Under. They are talented songwriters, musicians and the whole EP sounds exactly as it should. Clear, well-defined but brutal when it needs to be brutal as well. I honestly see no reason for them not to be picked up by a label that recognises their obvious talent. And as long as they keep putting atmosphere above the technical side, as they do now, I look forward to hearing from them in the future.